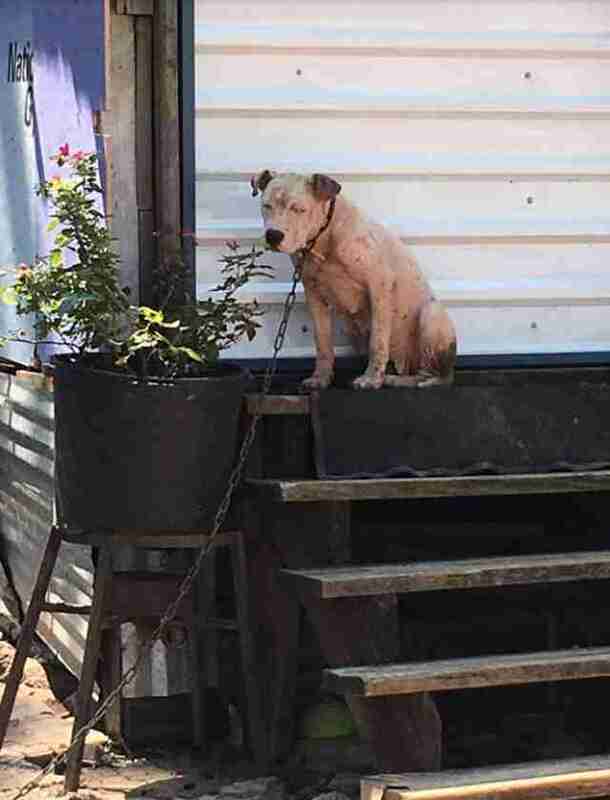 Gemma survived Hurricane Harvey despite being chained up in a heavily flooded town west of Houston, Texas. 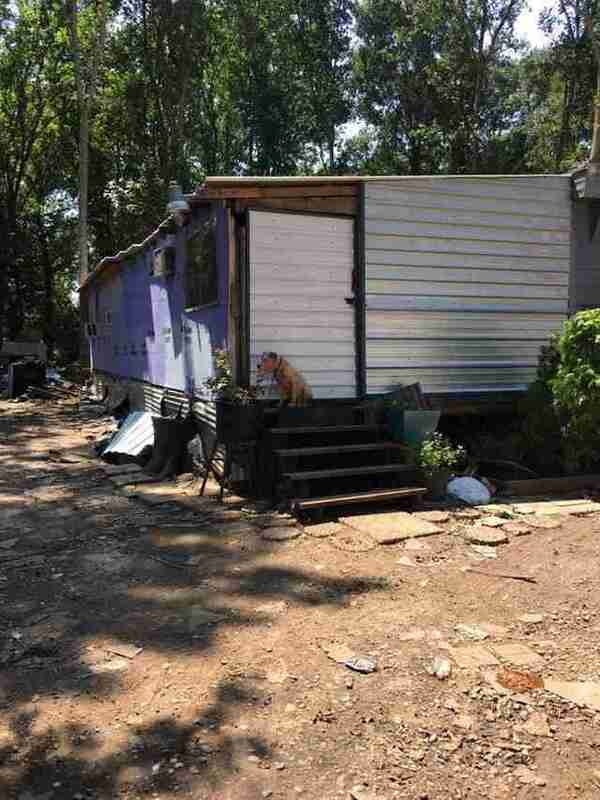 She had just enough room to get to the top step of a nearby trailer home. Two of her puppies sat on that step with her; the others didn't make it. 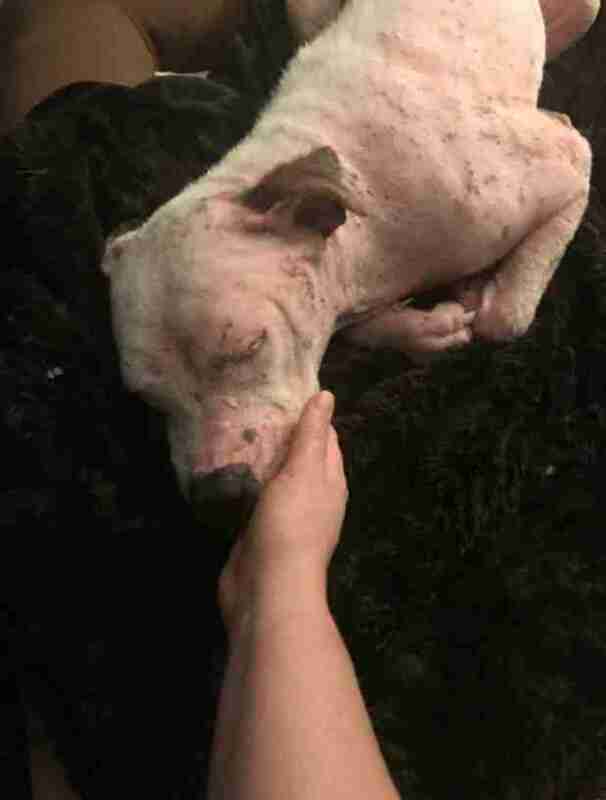 After being rescued last week, Gemma went to a foster home and "slept for a solid two days," Katie Wing, cofounder of Houston K-911 Rescue, told The Dodo. "She seems to realize she's safe." Discovering Gemma alive, with her remaining puppies, was a tremendous relief. 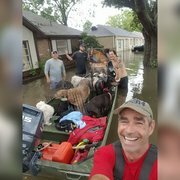 Volunteers with Houston K-911 Rescue have spent months helping the dogs who live in that area — finding homes for strays, distributing supplies and otherwise helping out so that the dogs who have owners also have basic comforts. Volunteers with the group worried about these dogs all through the storm and rushed over as soon as conditions were safe. They got to Gemma on Thursday — she was one of seven dogs and a cat Houston K-911 Rescue got from this one place right after Harvey. 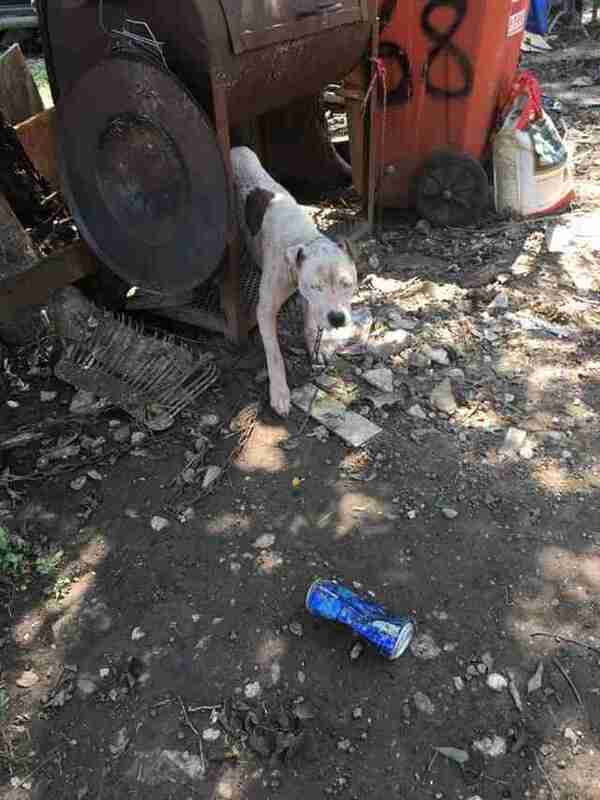 Gemma's former owner had left without even removing her chain, Wing and her fellow rescuers learned from people in the neighborhood. They'd left behind a potted plant too, which also survived on that same step through the storm. It broke Wing's heart to notice the plant seemed as if it had been better cared for than Gemma and her pups. Gemma growled and barked as the rescuers approached her. Once they removed her chain, she was like a new dog — smiling and wagging her tail. "Her demeanor changed completely," Wing said. "It really was hell on Earth for this dog." 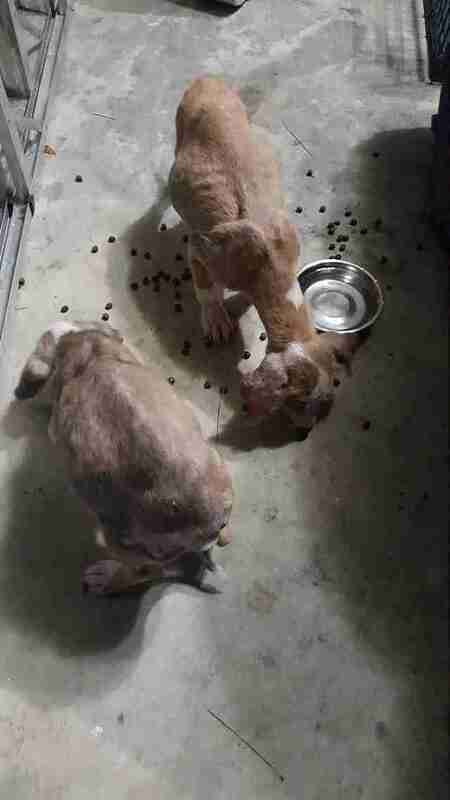 Gemma and her puppies are suffering from a wide range of health problems. They have raw, itchy and infected skin. 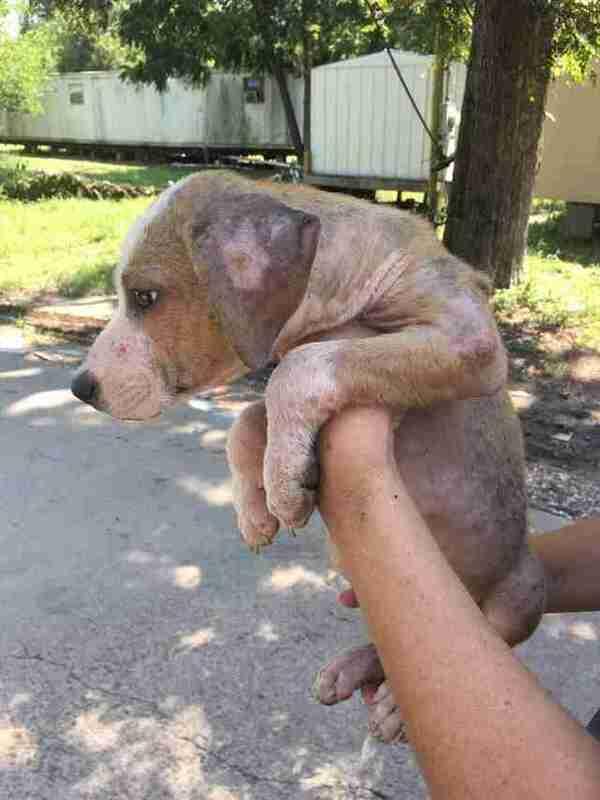 Gemma is also malnourished and has heartworms, parasites and issues with her immune system. Now named Opal and Onyx, the puppies are about 2 months old and big enough to be without their mother. They’re together enjoying life in a foster home, where they’re likely to spend the next couple of months as they heal and get ready for adoption. 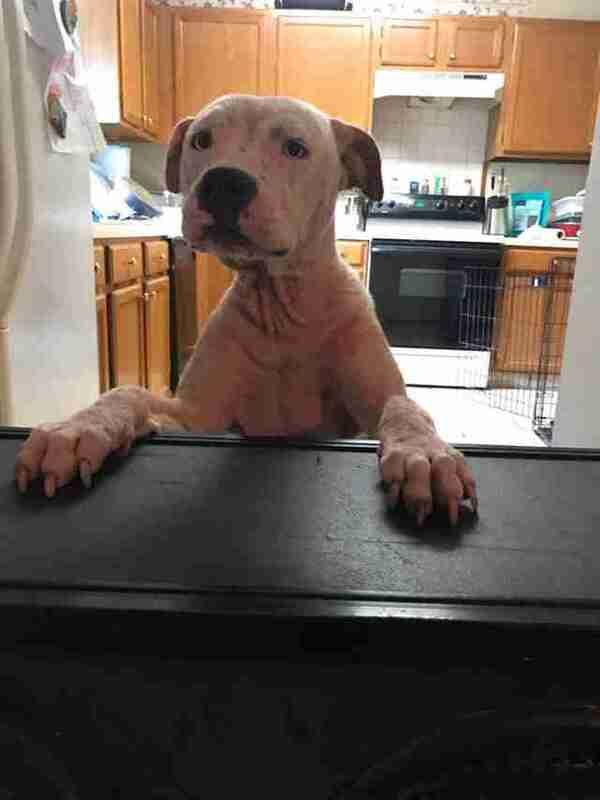 Gemma's in another foster home, where she has every comfort and her foster mom's attention all to herself. Gemma is getting lots of ear scratches and belly rubs, and is "certainly enjoying this," Wing said — which is good, since her more serious health issues mean she will probably be in her foster home for quite a bit longer. She doesn't seem like she'll mind that one bit. Looking at how happy they are now, Wing sometimes can't stop herself from thinking about how this storm nearly killed Gemma, Opal and Onyx. "It's the first day that will be a kind day to them in all of their lives," is how Wing put it in a Facebook post the day after their rescue. "We love you! You were rescued yesterday and things will start to get a lot better from now on." Follow Gemma, Opal, and Onyx on the Houston K-911 Rescue Facebook page. You can also donate to their care. The rescue has taken in a few dozen extra animals who needed rescue because of Harvey, and Houston K-911 Rescue is looking for more fosters and adopters, as well as help paying for their medical care. Adopters are especially welcome in Texas, Washington state and Wisconsin, but those in other states will also be considered.